In last week’s KnitBits, we introduced booklet #342 Berroco Linus, and it was a hit! The response was especially good for our short-sleeve lace cardigan, Harbour. Since this pattern includes a few tricky spots, I thought it would be the perfect topic for this week’s blog. When I first began to swatch, I have to admit I was totally confused. Nothing was adding up! I quickly realized that there was a paragraph below, explaining how to read the chart. So don’t be like me and try to speed ahead… take the time to read the key and your knitting will go beautifully. The extra repeats between B & C will help you get the right number! Once you’ve gotten that part down you can cruise along in knitting your sweater! When you reach the capped sleeves you will need to begin increasing in pattern. Don’t panic! 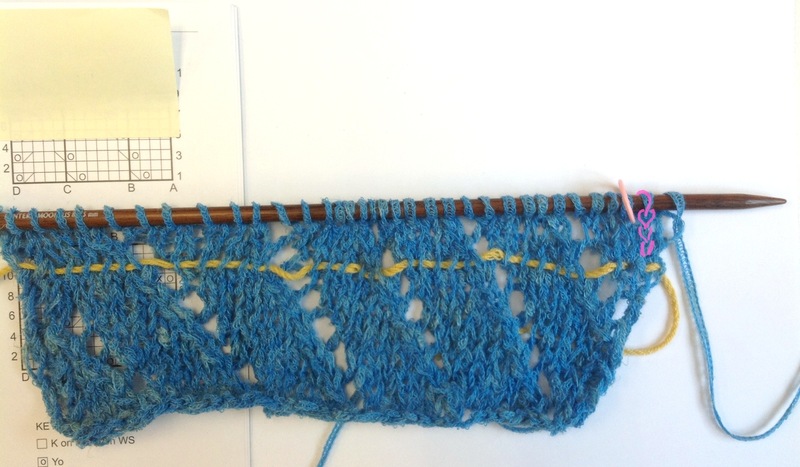 I’ve knitted a swatch to demonstrate. I began my increases on row 1 of the chart, but depending on the size you are knitting you may begin your pattern increases on another row. Not to worry – the same principles apply. I have highlighted the increased stitch made in row 1 and worked for 4 rows. On my first increase row, I followed my directions: k1, m1k. Then I placed a marker after my first increase to help me keep track of the number of increases I have made. I also added a lifeline in a contrasting color on the first increase row, which will act as a reference point in case I make a mistake. The directions tell you to then increase every fourth row, X times, then every sixth row X times. 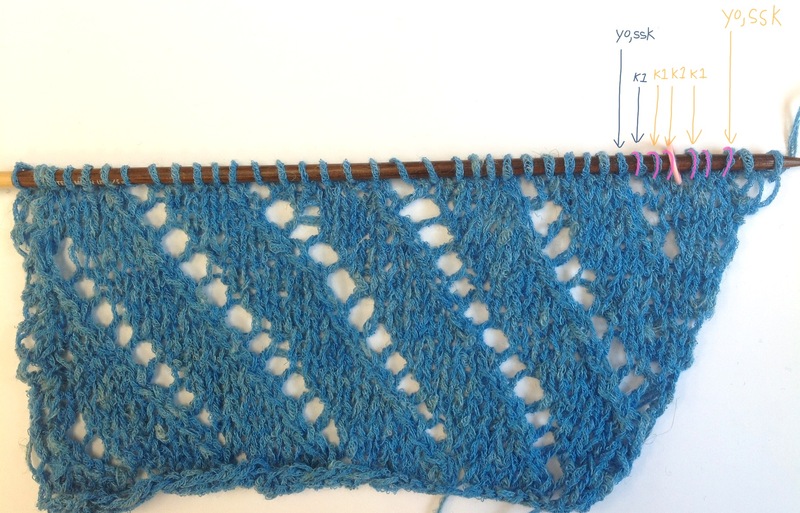 So you are knitting your increases until you have enough stitches to work into your pattern. Below I can see that I will make a K1, yo, ssk at the stitches I have drawn arrows to. I count backwards, including my K1 written in blue. I count, 1, 2, 3, 4, 5, 6. I have enough stitches to yo, ssk, k4! 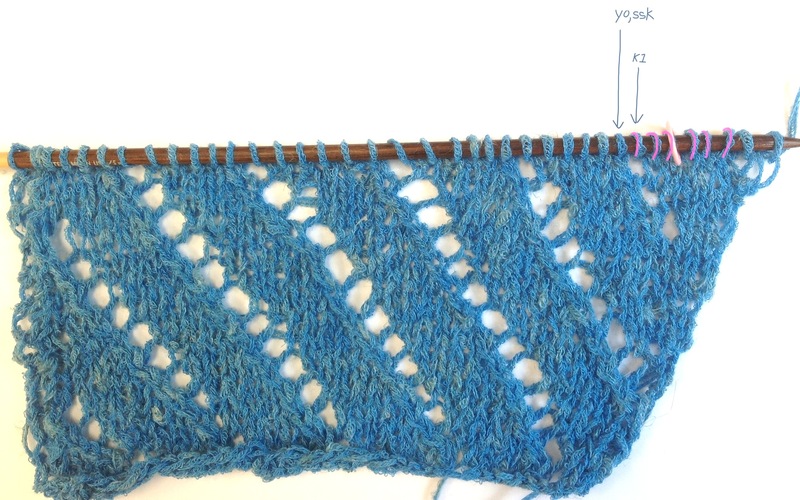 Pay close attention to how your knitting looks and the fabric will help you keep in your lace pattern. 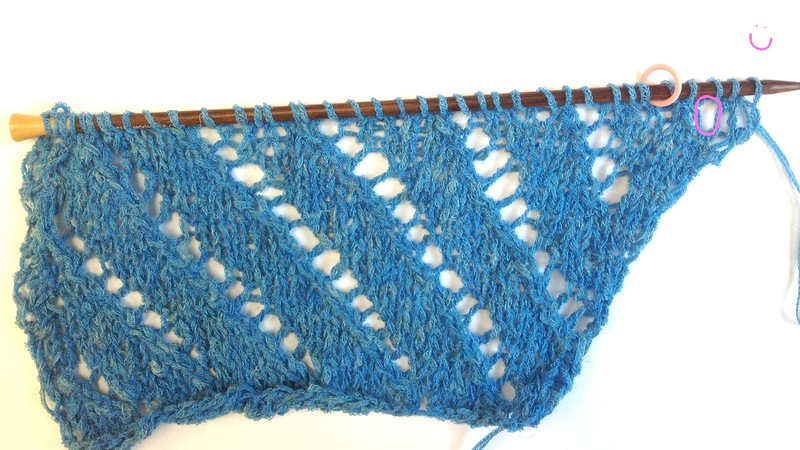 Previous article Norah’s Knits: Triangulate!